Mistakenly deleted data like contacts, messages, etc. on Android phone? Lost some precious photos unconsciously? Don't worry. 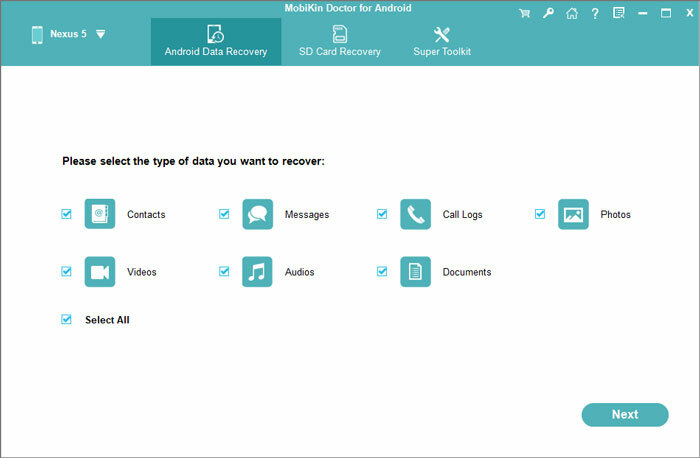 MobiKin Doctor for Android is here to help you get back all kinds of lost, deleted data on Android devices within clicks. Recover and save the media files stored in SD card, including photos, videos, audio and documents. Retrieve the existing files on your Android to computer for viewing and backup, such as contacts, SMS, call logs, photos, videos, audio and documents. To be a good data recovery program for Android devices, one of the most important features will be the high compatibility. As it is known to all, Android phones & tablets have too many models and brands on the market, so MobiKin have added the latest technology into the program and tried the best efforts to test for hundreds of times to ensure it can support as many as Android mobile phones and tablets that we can. Support different Android OS versions well. Previewing the data before recovery can make you check whether they are indeed what you want, so that you can avoid spending too much time to get back a batch of wrong files. Conveniently view the deleted or lost data since they are marked in red color. Preview the detailed contacts list or text conversation in the program to decide which one is your target file and mark them for restoring with one click. You can refer to this guide to learn how to access and view lost Android SMS. Photos and videos can be viewed in a Thumbnail view mode, so that you can quickly find your target images and other media files as you like. This Android Data Recovery softwot only works as the best Android Data Recovery program, but also performs well as the Android Backup program. That is mainly because this tool have the ability to scan and display both deleted and existing data on the Android phone or tablets. You can select all your needed data and transfer them from your portable device to computer for backup. Transfer or backup all from your Android devices to personal computer with a few clicks. Not only existing files, but also deleted or lost data can be found and backed up on your personal PC easily. No complex operation for backing up any Android data as you like. Users of MobiKin Doctor for Android Have Surpassed 740,000+ Worldwide. Great tool, I was able to get all of my lost information from my Android. I just wish they had a Whatsapp message recovery so that I could get those conversation as well. MobiKin Doctor for Android is a multi-functional desktop application, that allows users to scan & get back the deleted, lost or formatted data like contacts, messages, photos, music, videos, documents, etc. from all kinds of Android phones or tablets as you like. Now, let's have a look of how to use the program from different aspects. You can click the below icons to get the free trial version of the powerful Android Data Recovery software. But one thing you should pay attention is the free trial version only have the ability to scan and find your lost data, and if you wish to preview the detailed contents and restore them to computer, you have to get the full version. Part 1. How to Make Your Android Device be Recognized? Part 2. How to Recover Contacts, SMS or Call Logs on Android? Part 3. How to Restore Media or Other Files from Android Directly? Part 4. How to Recover Data from External SD Card Easily? 3) No matter what kinds of data you want to restore, you have to enable USB debugging to make the phone detected by the program. If you don't know how to enable USB debugging on your Android device, you can click the link to learn more detailed steps. Now, connect your Android devices to computer via its USB cable, and then you'll see an interface just like below. Here, if your device is running on the system of 4.2 or above, then you should go to your device and click "Allow" button on the device to allow USB debugging as follow. After that, the program will continue to detect and scan files on the device. When your phone is detected by the program, you'll be required to choose the file types you wish to restore, and hit "Next" button to start scanning for lost files. - If your device is rooted before, you'll get the below screen on your PC, and here, please grant permission on your Android mobile device and continue to scan for files. Bonus: If your Android device can't be recognized by the Doctor for Android, you can click here to find an ideal solution for this issue. - If your Android device is not rooted, the program will show you an interface like below. Here, you can go to the next step just as the instructions on the screen. Mark the data you wish to restore, and then click "Recover" button on the bottom of the panel to save the restored files on your computer as HTML format. Tick photos, video or audio for scanning in the main interface, then preview the scanning results in the form of folders. Below is the interface for your reference. Photos, video, music or other document will be scanned and saved in different folders according to its file type. So you can choose these folders and preview them in the right panel to locate your target files. After that, just mark them and hit "Recover" button to save them on your PC. 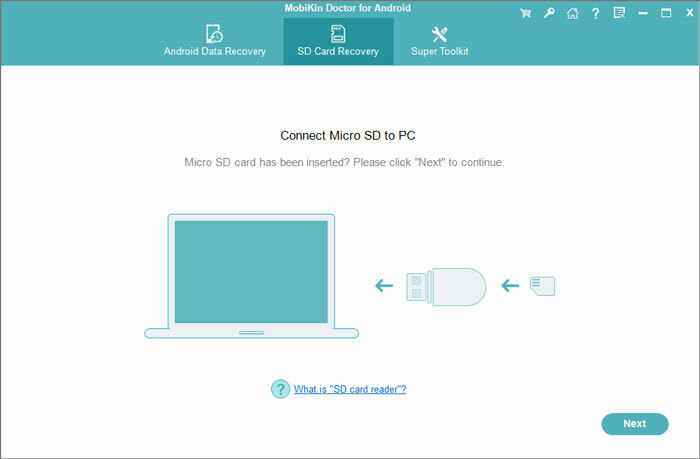 Choose "Android SD Card Recovery" mode on the top menu, and then you'll see an interface like below. Here, you'll be required to insert the SD card to your computer at first. Click "Next" to decide and tick the disk drive you wish to scan, and click "Next" to start the scanning. When the scanning is finished, you can preview the files and select your lost data, then click "Recover" button to save them on your computer. Note: Doctor for Android is fully compatible with Android phones and tablets, including the latest ones. For Android users, if you can't find your device on the list below, please take a free trial on it at first, then if you can't connect your device with Doctor for Android after trying, please connect our support team via email: support@mobikin.com. - Optimization in device connection. - Optimization in driver installation. - Optimization in USB debug recognition. - Fix registration invalidation problem. - Modify the text and fix the hyperlink issue of registration window. - Support multi-languages, including English, Japanese, German, French, Italian, Spanish, Portuguese. - Add a Home screen. - Fix potential crashing bugs. - Support the function of recovering data from Android SD card. - Fix some potential bugs. - Divide photos, audio, video and document into seperate folders.